Experience the finest fly fishing destination. Experience world class fly fishing in Chile with Coyhaique River Lodge on expeditions to the finest Patagonian fly fishing locations. Our first-class accommodations and experienced guides will make your travels smooth and your adventures unforgettable. We only book two fishermen with each guide for additional personal attention. Coyhaique River Lodge has many special waters for guests to choose from each day. 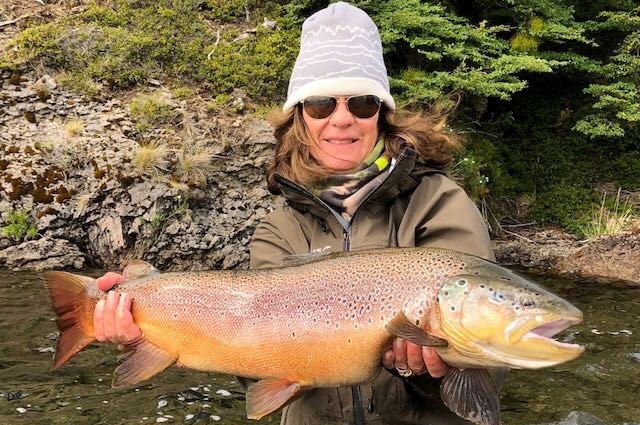 Whether it be the world famous Rio Simpson, a small stream meandering from a glacier high in the Andes Mountains, or a high country lagoon with monster brown trout, we always offer you a broad range of angling opportunities during your stay with us. The pure natural beauty of Patagonia is reason enough to visit us. “Give us a chance to share with you our great fishing and rich culture”. All transportaIon in 4WD vehicles. One bilingual guide per 2 anglers. Coyhaique River Lodge staff will meet guests at the regional airport of Balmaceda. Guests will be driven to the lodge in Coyhaique on the banks of the Coyhaiquer river. Welcome cocktail and lunch will be waiIng at the lodge. Depending of the Ime of the flight, guests can start the first a^ernoon of fishing, then back to the lodge for dinner. Breakfast and dinner are served at the lodge. Lunch is served at the river or surrounding area. Each evening the hosts and guides will discuss the best angling opIons for the next day. The schedule will depend on guest preferences, the best locaIons, weather, and water condiIons. Breakfast then choice of either spending the morning fishing, or go into town and shop for some, arts and cra^s of the region. Lunch will be offered at the Lodge. Transport to Balmaceda airport where guests will be flown back to SanIago in Ime to connect with their internaIonal flight. Rio Coyhaique: The lodge property has a mile of river frontage plus additional private access points to miles of easy wadding and large quantities of excellent fish. This river gets better every year and is still great fishing when the weather isn’t so great elsewhere. Rio Huemales: The river is wide with sandy bottom where you can wade down the middle and fish towards large browns hiding in the undercut banks. Many deep pools are fun to pull streamers and watch the big guys chase it all the way to your feet. Rio Simpson: It tends to fly fish like a classic Montana freestone and has significant caddis and mayfly opportunities. It is most often floated but, several wade options exist also. Browns and rainbows average 14-22 inches. However, trout up to 30 inches have been caught on a fly. This river has more fish per mile than perhaps any river in the southern hemisphere. A substantial run of King Salmon return to this river starting in November. Rio Nirehuao: This is perhaps the area’s most famous fishery. It is a mid-sized freestone wading stream renowned worldwide for its fantastic hopper fishing during mid-summer exclusively for wild brown trout. The lodge’s head guide Alejandro has guided this river for 12 seasons + and knows it like no one else. Fish average in the 12 -20 inch range but, those over 24” are present. Rio Mañihuales: The Manihuales has a little of everything including a lot of big trout! It is most often floated but, some good wade fishing is available on it very upper reaches. It has a healthy population of both Brown and Rainbow trout as well as a strong run of King Salmon. The Manihuales often surrenders fish well in excess of 20 inches during an average day with the Brown trout usually being the largest. This river has structure like no other and an incredible amount of prime holding spots making it a favorite amongst local guides. Several spring creek options are also available in the remote ranch land areas near the Argentine border. There are unlimited lakes, large and small, where you’ll never see another boat or fisherman the whole day. Many private still water options are offered by Coyhaique River Lodge and are highlighted by the incredibly productive lakes of the Cerro Castillo area. If you wish for a shot at that 10 lb trout of a life time, this would be the place. In addition to owners Gaston and Claudio being among Chile’s finest guides, the lodge also contracts several of the top guides from around the Coyhaique area. Always a favorite for guests is Alejandro Trepiana, who not only is a passionate angler who knows the surrounding waters like no one else but, also a talented professional guitarist who often entertains guests in the evenings. Have a favorite Beatles song? Alejandro surely knows it. Contact us for details and pricing on our weekly packages or extended vacations. We tailor your trip to fit your desires. Since weather can be unpredictable in Patagonia, we recommend guests bring wind jackets, rain jackets, shorts and pants, good walking and hiking shoes, cap, sunglasses, and sunscreen.